From Start to Finish: V.R. Camelot, Inc.
From the time you first contact the professionals at V.R. Camelot, you’ll quickly discover what we mean when we say ‘full service’. 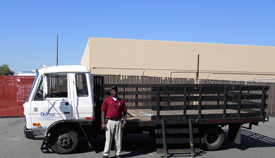 We understand that your business requires quick, cost-effective freight services and we make it happen. Air, sea or truck, or any combination necessary, V.R. Camelot handles every detail, freeing you to do business as usual with no worries. Door-to-Door Transportation From city to city, state to state or country to country, we’ll handle pick-up and delivery scheduling right to your requested delivery destination. Accurate Documentation Preparation Don’t get bogged down with logistics: that’s our job. All required paperwork is professionally handled, ensuring seamless delivery, including preparation of Bills of Lading, Airway Bills, Proforma Invoices, ISF (10+2) Security Filings, Formal, Informal and In-Bond Transportation Entries and more. V.R. Camelot will ensure total compliance with all foreign and domestic requirements. The Power of Networking working for YOU Throughout our history of providing unparalleled service, V.R. Camelot has spent years investing in business relationships with providers. Understanding their abilities, services and limitations allows us to offer solutions that get your cargo where you want, when you want, with no exceptions. and Italian Seaways: based in Genoa, Italy.